STORY SPOILER: Mr. Magorium is going to die. But who can he trust to take over his Wonder Empurium????????? 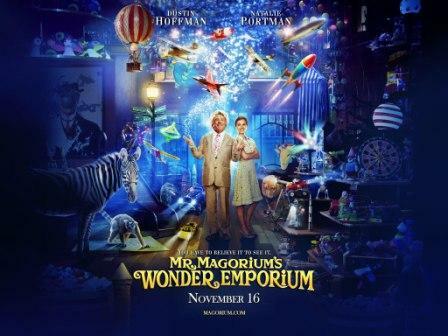 My favorite charecter is Mr. Magorium because he is the owner of the cool toy store (Wonder Emporium) and I like the toy store and I like that he makes everything. My favorite part of the movie is at the begining when they show how the toy store is not a regular toy store. It is a magical Wonder Emporium!!!!!!!!!!!!!!!!!!!!!!!!!!!!!!!!!!!!!!!! You get to know all the toys. I think this movie is appropriate for kids ages 5 and up. For grownups and some older kids it may be sad for them but for a five year old they might not understand the sad part(s). I hadn’t heard of this film. Sounds interesting. Add this to the list for Thanksgiving holiday viewing. Ethan you and Dylan have told me that this is a must see and who doesn’t want to be in a magical toy store?